This photo was published in the Milwaukee Journal on Sunday, September 7, 1952. 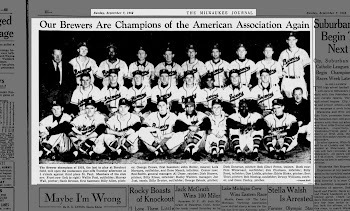 The Brewers had just claimed their eighth American Association title, which nobody knew at the time would also be their last. The 1952 Brewers finished the season with a 101-53 record, twelve games ahead of the second-place Kansas City Blues. They beat the St. Paul Saints in the first round of the playoffs (to determine the American Association representative to the Junior World Series), but fell to the Blues in the second. The Blues went on to lose to the International League's Rochester Red Wings in the Little Fall Classic. Today, this Brewer club is regarded as one of the top 100 minor league baseball teams of the 20th century. 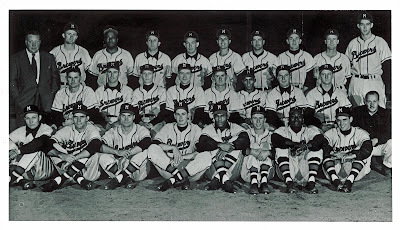 They would have been looking forward to their move to the brand-new Milwaukee County Stadium in 1953, but were bumped during Spring Training in favor of the relocating Boston Braves. 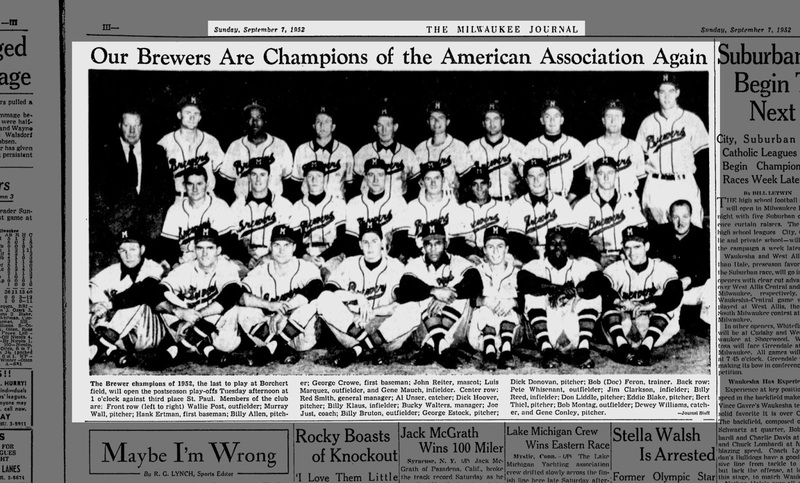 This Brewer team would not only be "the last to play at Borchert field", but also the last to play in Milwaukee until Bud Selig adopted their name for his new American League club in the spring of 1970.